There are some people who believe that games should stay games and never deal with "real issues", but Parable of the Polygons, by Vi Hart and Nicky Case, shows just how great games can be used to illustrate important concepts. This simple game uses fussy little polygons to illustrate how a slight personal bias can lead to racially segregated neighborhoods. Go ahead, just try to make these squares and triangles happy. 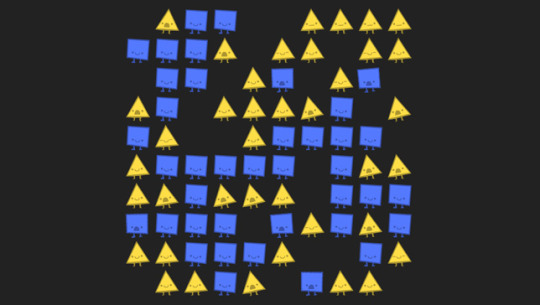 Billed as a "playable post about the shape of society," Parable of the Polygons leads you through a series of puzzles where its your job to make the tiny squares and triangles all happy by shifting them around until their living conditions are diverse... just not too diverse. Different puzzles impose different conditions for happy shapes, and as you progress down the post's games, you'll come to see how each neighborhood of shapes grows more and more segregated without intending to.